Workmanship of the products (grates and channel) is guaranteed for 10 years. At the condition that products have been installed in accordance with our installation instructions and guidelines and in accordance with the appropriate standard (plumbing code AS3500) current at the date of installation and all relevant statutory and local requirements in the State or Territory in which the product is installed. It is guaranteed that the stainless steel material provided is 316 grade stainless steel (or 304 grade if specified). Mill Certificates are available. 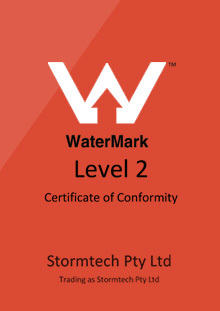 However, Stormtech does not control the availability of these certificates from the mills. ‘Tea staining’ is a maintenance or installation issue, and as such Stormtech cannot control these factors. Requests for service due to tea staining cannot be accepted by Stormtech. To reduce the risk of superficial staining or tea staining, please refer to the product care statement. Individual sites and situations can have dramatically different requirements for maintenance. The grates and channels must be kept clean, and corrosion reducer/inhibitors may need to be regularly applied. If the grates are used in or around pools Stormtech recommend the grates are electropolished regardless of the type of pool water used. Under the Australian Consumer Law you are entitled to a replacement or refund for a major failure and for compensation for any other reasonably foreseeable loss or damage. You are also entitled to have the goods repaired or replaced if the goods fail to be of acceptable quality and the failure does not amount to a major failure. As per point 2. major failure that relates to installation, assembly or other than actual material properties is not covered in this document.